The American Liver Foundation bestowed the “2017 Healthcare Visionary” upon Michael Volk, MD, medical director of the liver transplantation program at Loma Linda University Health, an award that underscores his nationally recognized contributions to the fields of hepatology, gastroenterology and effective health care delivery. Volk received the award during the foundation’s annual Flavors Culinary Experience fundraising gala in Orange County on Oct. 15. Volk has spearheaded regional growth and advancement of hepatology and liver transplant care and research since joining the Loma Linda University Health Transplantation Institute in early 2015. He streamlined two liver service operations into one, and the institute now has five hepatologists caring for liver patients from the Inland Empire and nearby desert regions, eastern Orange County and southern Nevada. The institute has roughly doubled the number of liver transplants it performs annually. Under Volk’s leadership, Loma Linda University Health opened a satellite liver clinic in Las Vegas in February 2017, minimizing travel for Nevada hepatology patients. Now, these patients receive all their pre- and post-surgical care close to home, only coming to Loma Linda for the surgery and recovery period. So far, three Las Vegas-area patients have undergone liver transplant under this process. To provide similar benefit, in January 2018 the Transplantation Institute will open a satellite liver service clinic in Irvine, Orange County. Coinciding with Liver Awareness Month and Liver Cancer Awareness Month, the Flavors Culinary Experience gala on Oct. 15 afforded Volk the opportunity to speak about a topic vital to the health of liver patients and one of his research fields —supporting caregivers in their essential role as a family member or friend of a very ill loved one. “We cannot effectively treat our liver patients if, in between visits, they don’t receive optimal home care and assistance with health maintenance tasks such as getting lab tests and filling prescriptions,” he said. The Transplantation Institute is currently conducting two clinical studies, with Volk as principal investigator, extramurally funded by the American Association for the Study of Liver Diseases and the Patient-Centered Outcome Research Institute. 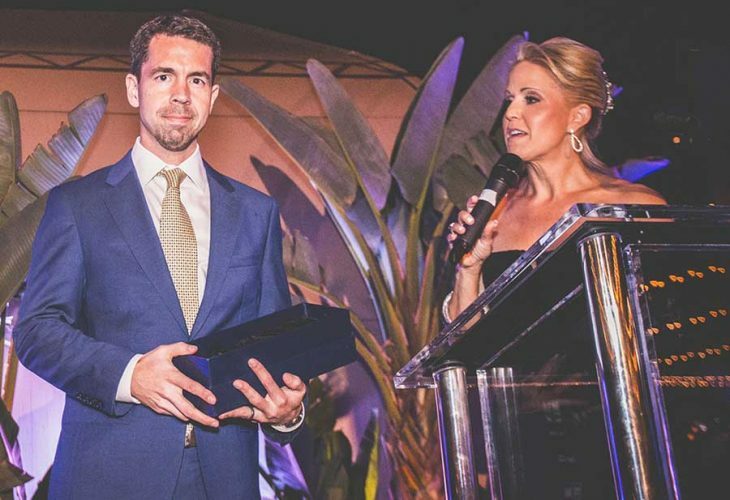 This is the second consecutive year that a physician from the Transplantation Institute at Loma Linda University Health received the “Healthcare Visionary” award from the American Liver Foundation during the Flavors Culinary Experience gala in Orange County. In 2016, Michael de Vera, MD, director of the Transplantation Institute, also received the honor. Loma Linda University Health is this year celebrating 50 years of transplantation, which began in 1967 when surgeon Louis Smith, MD, successfully transplanted a kidney to save the life of a male patient who had been on dialysis for 100 days. Fifty years after this first kidney transplant in inland Southern California, Loma Linda University Health’s Transplantation Institute remains the regional leader in comprehensive transplant care for children and adults.